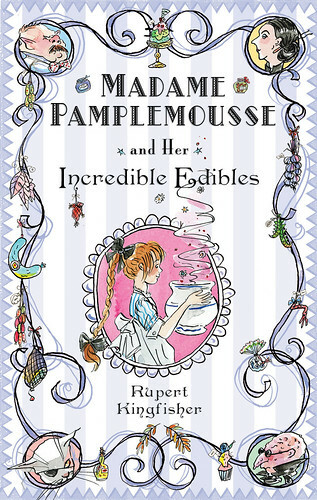 Madame Pamplemousse and Her Incredible Edibles is a bit of a mouthful, and so, I believe, is her cooking. This is a short and charming little story by a new author, Rupert Kingfisher. Very elegant kind of name for a writer, I think. The book is elegant, too, looking like some posh lilac, striped wallpaper, with pictures that make you think of Quentin Blake and Roald Dahl. In this case the illustrations are by Sue Hellard. Personally I’d have preferred any colour but lilac, or pink, to prevent the book having too girlie an appeal. There’s enough of pickled snake and jellied frogs (or stuff like that, revolting food…) to appeal to boys as well. So, wrong colour, I think. Little Madeleine has to spend all her holidays with horrible uncle Lard in his charmless Paris restaurant. She’s Cinderella-like; can cook like a dream (she’s nine, I think), but gets to do the washing up. Enter mysterious cat and his mysterious lady owner in their mysterious, and I think revolting, food shop, and everything is turned upside down. I can’t get the word “Ratatouille” out of my head. I hope Rupert wrote his book before the film, because there are lots of similarities. Anyway, this should appeal to foodie, Francophile parents. My vegetarian instincts kicked in too early to thoroughly enjoy Madame’s food, but I was reminded of the time when we were invited to taste Edam (that very normal and slightly boring cheese) that the shop owner had let mature for three and a half years, just to see what would happen. The Edam nearly walked out of the shop unaided, is what happened. I’ll never forget it. This time a year ago I blogged about bilberries. I picked all twelve of them. So when this year I discovered that I also have cowberries, a few feet away from the bilberries, I was quite pleased. I found at least thirty tiny red berries, so red seems to do better than blue. Haven’t yet worked out what to do with my harvest. 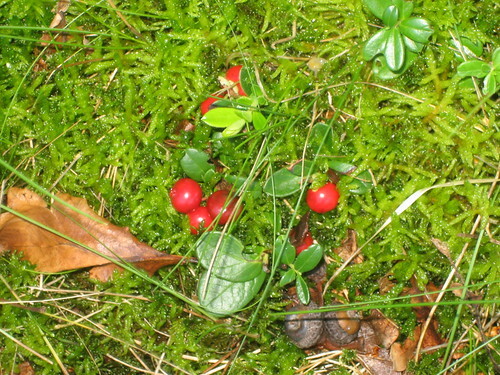 Cowberries often go by the name of the red gold of the wood, and people pick them by the bucketful. Unlike cranberries, which I understand are cultivated, I think all cowberry preserves sold originate in the wild. I obviously have some way to go towards even a first bucket. I also have tame, but aggressive, blackberries, that are so thorny I can barely get close enough to pick. And two apple trees full of apples, not ready to pick. Am leaving the mushrooms alone, in case they are toadstools. Magnificent size, whatever they are, which may be due to the very wet summer. The apples already on the ground, have been carted up to the woods by the Resident IT Consultant, where I hope they will feed either the deer or, preferably, a passing elk or two. With a bit of luck we can have punch drunk, enormous beasts cavorting round the garden. This isn’t about books, either, unless you count the cookbook I’ll need to sort out the future of thirty cowberries. If you are labouring under the impression that the witch family does nothing but eat while on holiday, you’re quite right. We don’t. And it looks like we won’t even be able to eat our way through all our usual eateries this year, as time is almost up. Börjes is the most wonderful of bakers, in Harplinge village, near us. 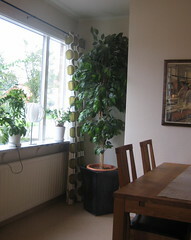 Situated in a 1950s house in the middle of Harplinge, it’s the third generation running this bakers and café. Never mind that the two sons trained to hunt or something, (according to gossip), I’m so glad they bake instead. Their bread is out of this world, and changes daily. Farmor’s (grandmother’s) loaf is the best of them all. With the whole village buying their bread from Börjes, you’d be lucky to find anything left to buy come mid afternoon. 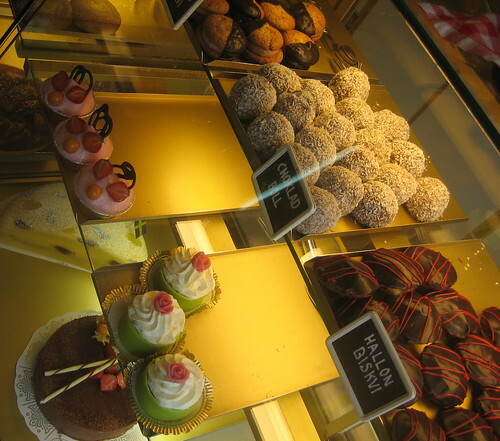 As for the patisserie, which you either eat in their 1950s style Konditori, or take home for private gluttony sessions, it’s very, very good. 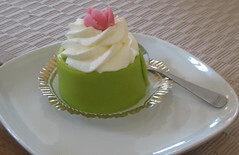 Their Prinsesstårta (a green gateaux) is simply the best. The witch and the Resident IT Consultant turned, well, about 27, a couple of years ago, and ordered several for dessert for the birthday party. I have on occasion tried to interest Son in going to work there, in order to learn all their recipes. No success yet. Readers with good memories may recall the BMW in my holiday garage, which causes the grass to be cut when I’m not there. I should obviously never have mentioned it, as this time round I got a surprise when I opened the garage door. There was space! It was clean! In other words, the BMW was gone. In its place was a small, blue, boy’s bicycle. The bike seemed quite happy, standing with some bigger bikes that have lived there for much longer. I was slightly worried as to whether I should admit to the car owner that I’d lost his car, but soon afterwards there was an invitation to come and eat salmon sandwiches, and it seems the BMW went voluntarily. How, is another matter, as the battery must have been long dead, and the tyres were not in a good state. But at least the annual carrying of garden furniture between garage and deck should prove easier now. Single-handedly hoisting a heavy table over a non-moving car requires a lot of skill with the wand. Son recently broke the news that he has purchased the Moomins on DVD. That will have to be the ultimate proof of the appeal of the Moomins, although personally I require the Swedish speaking Finnish version. 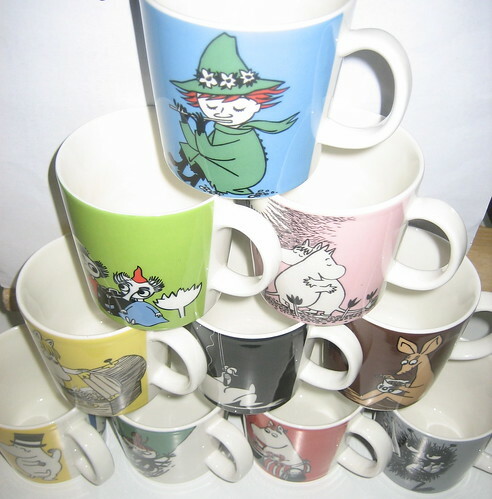 School Friend is a great fan of the Moomins. We invaded her house the other day (and night) and were treated to lovely tea, served in her Moomin mugs. Years ago, SF’s two daughters started the collection with two mugs, and it has grown to thirteen by now. I understand it’s so bad that SF can’t actually pass a new motif Moomin mug in a shop, without grabbing her wallet for yet another adoption. But then, you can’t possibly have too many mugs, when they look as adorable as these do. Apologies to the SF cats, who didn’t make the blog subject this time. We’ll get to you some other visit. Sarah Dessen’s first novel, That Summer, has such a good title. I’d been saving it as a treat for summer reading, so felt I had to hurry before autumn approaches far too fast. It’s about weddings and relationships and growing up. For Haven (what is it with Americans and their names?) it’s literally about growing, as she gets taller by the week. Her sister is getting married, and the sister’s former boyfriend turns up again. The book is a little shorter than some of the later ones, and I wouldn’t have minded if Sarah had elaborated a little on some of the issues here. But it’s still a lovely read. And can anyone enlighten me on the subject of Pop-Tarts, please? They turn up often, and I’m completely in the dark. My strongest memory of this book by Cæcilie Lassen, is how hard it was to come by. That was eighteen years ago, so I thought that with the internet it would probably be easy peasy today. It may be, but a quick search yields no book for sale. And I don’t need another copy, as friend Pippi eventually unearthed someone who would sell me the book, and post it from Denmark to England. Because the trouble started with the witch turning snobbish and insisting on reading Lulu in the original Danish. The translation would have caused no problems at all, but why make life easy? It began with me reading an interview with Cæcilie, and I thought the book, set in Copenhagen during the war, sounded so interesting, that I had to have it. In Danish. It’s Cæcilie’s second novel, and was first published in 1988, when she was seventeen. That’s second novel, and aged seventeen. Sickening how some people can be successful so young. (Just a bit jealous.) I’ve had a little look on Google and Wikipedia for fresh information about Cæcilie, and she seems to have written at least eleven novels by now. Anyway, Lulu is a girl of sixteen in Copenhagen during the war. She’s still at school, but she joins the resistance; at first doing simple jobs, but gradually getting more dangerous tasks. She is arrested by the Gestapo, has to stay away from her family, and she falls in love. It’s a fairly typical coming-of-age novel, but I think what set it apart for me was reading about the war in Denmark, and also having someone that age – neither a child nor an adult – being active in the war effort. I’m glad I persevered despite my shopping difficulties, and I’m sure the story gained by being in the original language, although I might not repeat the experience any time soon. And I always feel rather guilty thinking of what I put several people through, searching for my book.